Stand firm. God didn’t bring us this far and then forget our names. God jolted me this morning with this quote, bringing there important reminders to mind. 1. We can stand firm even when what we see is shaky ground. For He is our foundation, not this world. We keep forgetting this absolute reality because we can’t see it through our earthy sight. He has us safe in His grasp, and because of that truth, we can stand. At His side, firmly planted on Him as our Rock, our solid foundation. 2. God has brought us this far. You & I? We exist because He created us to. Our all was brought into being by His work. Jesus came to reunite us with the Lover of our souls. He has done all the work all the way along, and He always completes what He starts. 3. 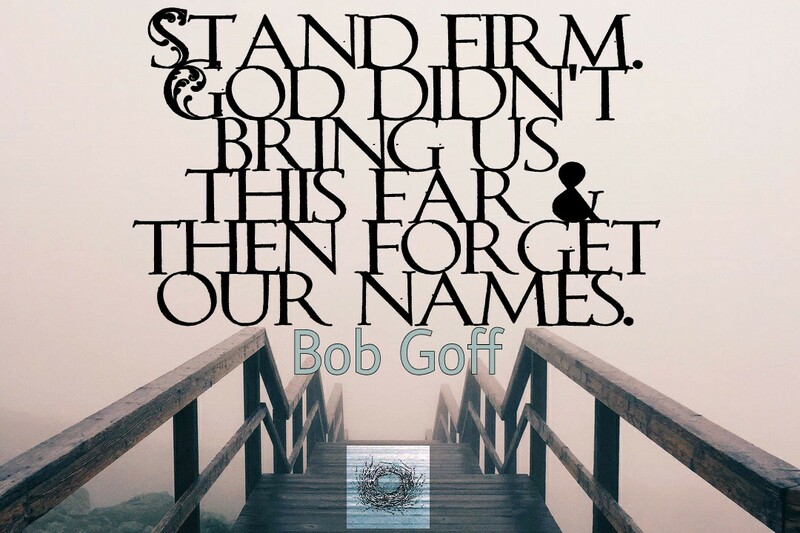 He will never ever forget your name. Nor mine. God has emblazened each of the named of His Beloved upon His heart. His love was so great, the scars of our redemption are visible for all to see. No one dies for the world then forgets who they died for. Nor only does He not forget you, He knows your true name. The one He is bringing into being as you allow the Master Potter to shape you into the vessel He designed you to become. God does not give up on His investments. Not a single one. Today, rest in the knowledge that He has you. All of you. That despite the stormy weather, the piling obstacles & the sometimes howling voices declaring the opposite, the truth is He will never leave you, forsake you, abandon you, unlove you, ever. You can stand, no matter what. Thank you, I truly needed this today. It is hard when you feel that He has not heard your prayer.